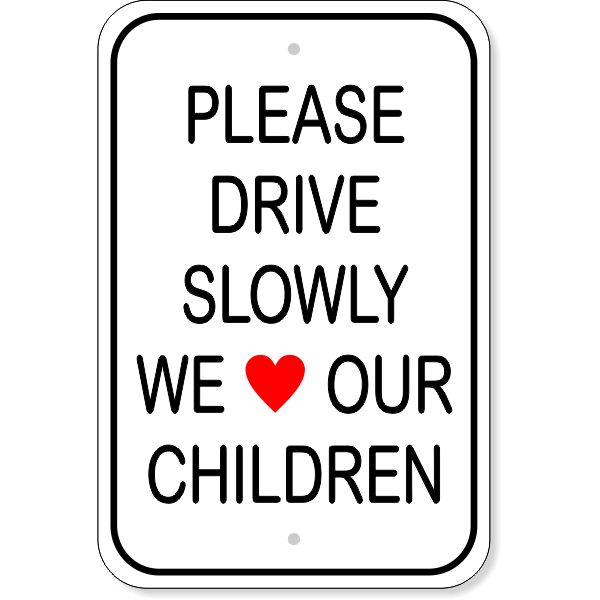 Tell drivers to drive slowly through your neighborhood with this aluminum sign that children are present & you want to keep them safe because you love them. No Alcohol No Drugs No Firearms Aluminum Sign | 12" x 12"
Notice No Trespassing Aluminum Sign | 12" x 12"
Red Stop Bullying Vinyl Decal - 6" x 6"
This 18" x 12" Please Drive Slowly We Love Our Children Aluminum sign is perfect for posting in neighborhoods or around parks to remind drivers to be careful in the area. Keep your playground & surrounding areas safe from reckless drivers letting them know that they are in an area with kids are playing. This sign is printed on vinyl and mounted to heavy duty aluminum. Two pre-drilled holes are at the top & bottom for easy installation. Aluminum has 1.25” radius corners to protect you from sharp edges and gives a professional finished appearance. For longer life of your printed sign, add lamination for a few dollars more. Lamination helps protect from UV rays to extend the life of your signs and is recommended for outdoor signage. For roofed parking garages, the vinyl print & aluminum will last for several years without lamination with no sun exposure. Order your 18" x 12" Please Drive Slowly We Love Our Children today to keep the neighborhood kids safe from motor vehicles. Most orders ship the next day!